With the important events of Cosmo Canyon behind me, I continued on towards Nibelheim. Revisiting this pivotal place was clearly strange with the fact that the town still stands. As the party wondered why Nibelheim wasn't in ashes, I spent my time getting the optional parts here, such as adding Vincent to my roster of characters. Heading through Mount Nibel made it feel like there should have been something happening there, some part of the plot. Or at least the characters reacting to being back in a place where such pivotal events occurred before, so it was a little disappointing to go into the old mako reactor without any words from Cloud or Tifa. Seeing as how you could look around but nothing else of interest remained, I pressed on past the mountains and towards Rocket Town. 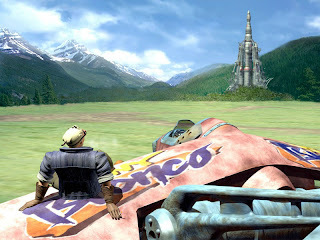 An interesting bit of side-story followed with Rufus showing up to commandeer the Tiny Bronco, as well as Cid's backstory to it. Though that was mostly all at this stage, “interesting.” It didn't cross the line to exciting really, except for maybe just a little during the video of the escape. Okay, I admit that was fun, even if the other parts in Rocket Town were just so-so. Altogether, things went by fairly quickly, which made this chapter feel more like a footnote in the greater scheme of things. That is not to say, however, that having the Tiny Bronco itself was of no consequence. Because it was actually quite important, as it allowed you to access parts of the world that were inaccessible before. 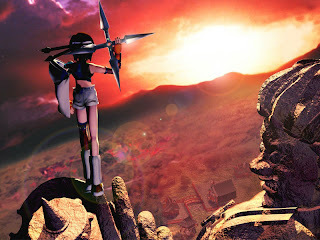 The most notable of these was the island that Yuffie calls home. An entirely optional part, Wutai was the side-quest tied to that character. Seeing as how I was going for anything of importance in this play-through, I headed out to Wutai to try my luck. 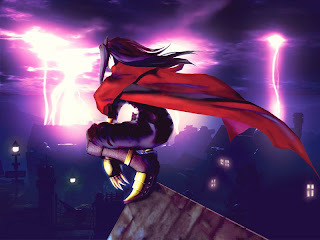 I don't think that I played this part the first time through Final Fantasy VII, but I may have. Either way I didn't remember it. So the events felt quite new to me, and Yuffie's shenanigans of stealing our materia meant that I had to commit to the side-quest. In for a penny, in for a pound, as they say. I got through running after Yuffie and even doing the pagoda without problems. Though not integral to the main plot, the events were amusing and served to develop Yuffie's character further. And with that behind me, I was eager to get back to the main story and finally get some more plot. This is where it got more interesting on Disc 1. Although it could be a little tricky to figure out exactly where to go next, the big clue was at the lone house on the point not far from the Gold Saucer. The man inside said he just sold the Keystone, and that's what you needed to go after. Apparently Dio decided to add it to his collection, but Shinra and Sephiroth were after it too. So off to the Gold Saucer we went, and after talking to Dio it was time for some battles. This part was actually fairly challenging, and I had to retry several times. I kept getting killed before beating the last enemy, and that wasn't acceptable since I had to get those extra items. The section between Rocket Town and returning to the Gold Saucer felt very disconnected. There was very little to actually tell you where to go next, and knowing the next clue's location was only due to my previously acquired knowledge. As I recall, however, the first time around I fumbled along the coasts to find something for quite a while. I think this could have been designed a little better to facilitate smoother progression for the player. Unless of course Square intended for you to explore the world with the Tiny Bronco and talk to random people in random places and eventually stumble onto the right bit of info. That is a distinct possibility. More importantly, however, after obtaining the Keystone it was not possible to leave the Gold Saucer just yet. So the party decided to go to the inn, and Cloud did a little recap of where we stood. Nothing special there. While Cloud was up in his room however, Aeris paid him a visit. 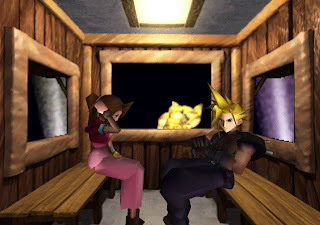 This was one of the key moments of the game as far as I'm concerned, as Aeris told cloud that he was about to go on a date with her. Not “asked” him on a date, mind you, but “told.” The ever-opposite-of-smooth Cloud was taken rather by surprise, but naturally had little choice in the matter. These events were key to Aeris' character. She divulged a little more information about her mystery boyfriend from the past, and how Cloud was so much like him. But again, no details, so you still didn't know who he was really. A nice video of the gondola ride around the Gold Saucer ensued, and the date was going smashingly. That is, until I ran across Cait Sith stealing the Keystone. Of course, you couldn't just forget about it, so the cat-and-mouse chase was on. After following the thief through a few different areas, clearly the whole thing was meant to be easy, the romantic couple caught up with Cait Sith and put him through the ringer. Turns out he was the spy all along, and was working for Shinra. The weird body was just a puppet/robot being controlled by some unknown entity, and you had no choice but to go along with the charade as they got to Aeris' mother and Marlene. So the plot thickened. We retired to the inn, and the next day it was time to make our way to the Temple of the Ancients. So far, I had kept Aeris in my party for the entire game. I wanted to level her up as much as possible, and even went so far as to get her final Limit Break. It was important to do this in terms of gameplay I thought, which got you as much from her character as possible, but also I thought it important for the story. In anticipation of what was to come, I wanted to facilitate my attachment to Aeris. Spending so much time with her in my party made her a much more permanent fixture in my FFVII universe.